"The results debunk the myth, but also underscore something we’re always telling our members: check your assumptions with real data." 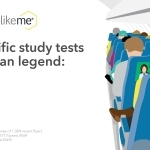 CAMBRIDGE, Mass.--(BUSINESS WIRE)--With spring travel in full swing, PatientsLikeMe has published results of the first scientific study to explore whether we are more likely to cry watching a movie on a plane than on the ground. The pseudo-phenomenon is often reported by celebrities and the media and is sometimes called altitude-adjusted lachrymosity syndrome (AALS). The most likely contributor to crying behavior isn’t altitude, mild hypoxia or alcohol, but the type of movie people chose to watch. People watch more dramas and family films on planes and more action movies on the ground, and on the plane, dramas provoke the most tears. 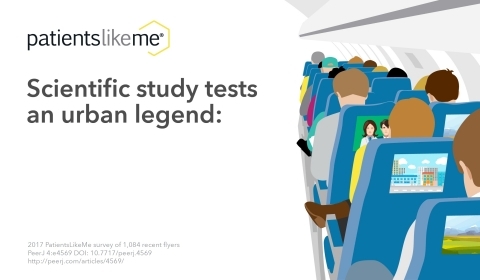 About 43 percent of flyers who watched a drama cried, compared to 30 percent of flyers who cried watching animated or family features, 25 percent who cried watching action, fantasy or sci-fi films and 14 percent who cried watching comedies, including romantic comedies. The top five dramatic films that made people cry were, in order: “The Zookeeper’s Wife” (100 percent of those polled who watched the movie cried); “Okja” (90 percent cried); “Lion” (65 percent cried); “La La Land” (59 percent cried) and “Moana” (42 percent cried). People reporting AALS are also most likely experiencing “dramatically heightened exposure,” binge watching more films on a plane in a week than they would in a year at home or in a theatre. Gender played a part. While the study found females are more likely to cry than males, researchers suggest this has more to do with socialization to certain film choices, and the idea that men are less likely to accurately self-report instances of crying.